An American made bandana sewn onto a traditional buckle dog collar of a complimentary color. A great way to dress any dog up with some attitude!. Hamilton Gunmetal Series Double Thick Nylon deluxe collar is made of premium grade durable nylon and strength tested hardware, these collars are designed to last. Rich, fade resistant gemstone colors with custom gunmetal finish hardware and eyelets is the perfect blend of function and fashion. FeaturesExceptional strength and durability. Latigo Round Collar is rounded over lengthwise and is beautifully sewn together. Size - 1/2 x 16 in. 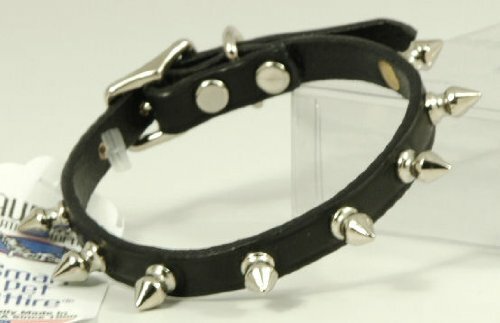 Leather Dog Collar. Dimension - 18 x 1 x 1 in. Item Weight - 0.07 lbs. Auburn Leather Black Pet Dog Collar Spiked 10"-12"
A beautiful glittery collar with alternating faux pearls and Austrian crystals. Fits a neck size from 10-12". Made in the USA. Glittery faux leather collar in a festive combination of colors adorned with enamel bones. This large (size 16) collar measures 1/2" wide and fits 10 1/2" - 14 1/2" neck sizes. An American made collar adorned with a charm secured with two handset crystals onto a traditional buckle dog collar of a complimentary color. A great way to dress any dog up for Halloween!. 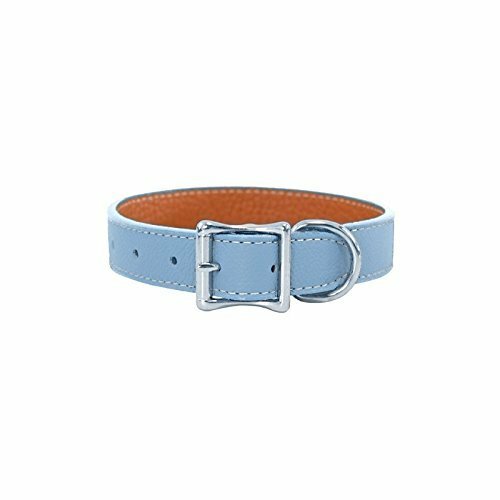 16274 Color: Light Blue, Size: 0.63" x 12" Features: -Handcrafted with Italian leather.-Fully lined.-Bright nickel hardware.-Made in the USA. Dimensions: -Dimensions: 0.5" W x 8" D, fits neck sizes 6" - 8".-Dimensions: 0.5" W x 10" D, fits neck sizes 7" - 10".-Dimensions: 0.63" W x 12" D, fits neck sizes 9" - 12".-Dimensions: 0.75" W x 14" D, fits neck sizes 11" - 14".-Dimensions: 0.75" W x 16" D, fits neck sizes 13" - 16".-Dimensions: 1" W x 18" D, fits neck sizes 14" - 18".-Dimensions: 1" W x 20" D, fits neck sizes 16" - 20".-Dimensions: 1" W x 22" D, fits neck sizes 18" - 22".-Dimensions: 1.25" W x 24" D, fits neck sizes 20" - 24".-Dimensions: 1.25" W x 26" D, fits neck sizes 22" - 26". Warranty: -Warranty: 30 Days. Hamilton 1" x 22" Burgundy Rolled Leather Dog Collar is made of the finest vegetable tanned leather. The craftsmenship that goes into this rolled leather dog collar is impressive. Constructed for durability and comfort. Also available in black. 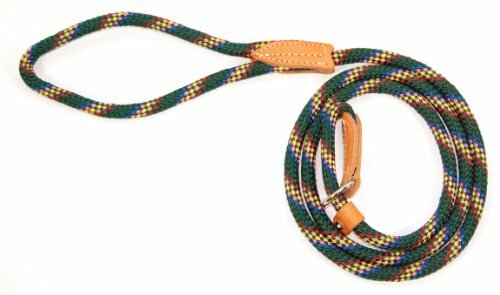 Hamilton 1" x 6' Burgundy Leather Training Dog Lead is made of the finest vegetable tanned leather and accompanied with the finest of hardware. Also available in black. Hamilton 1" x 26" Creased Black Leather Collar is made of the finest vegetable tanned leather and accompanied with the finest of hardware. Also available in burgundy. 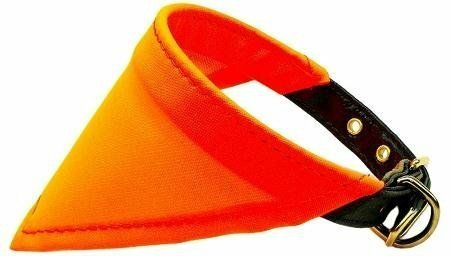 An American made bandana sewn onto a traditional buckle dog collar of a complimentary color. A great way to make any hunting dog visible!.